Infiniti Performance Yachts has entered into agreement with world renowned boatbuilder, McConaghy Boat, to build its Dynamic Stability System (DSS)-equipped Infiniti 46 and Infiniti 53 semi-custom racing yachts. Since it was set up in Sydney in 1967, McConaghy Boats has constructed some of the world’s most successful keelboats, America’s Cup challengers and round the world race boats. At one end of the spectrum it has constructed 18ft skiffs for use on Sydney Harbour; at the other end, for more than a decade, McConaghy Boats has been the international builder of choice for maxi boats, including, notably, the 100ft multiple Rolex Sydney Hobart winner, Wild Oats XI. A decade ago, McConaghy Boats opened a giant 10,000sqm build facility in Zhuhai, China, 50km west of Hong Kong. Run by a mix of Australians, New Zealanders and Americans, Volvo Open 70s and America’s Cup Class monohulls have been built here, but the facility’s bread and butter are its one designs. These have included several hundred Mach 2 foiling Moths, the Ker 40+, 42 and 46, the Elliott 6m and 7m, the J/70 and the MC38 one designs. From 2016 these will now be joined by the Infiniti 46 and Infiniti 53. Mark Evans, Joint Managing Director of McConaghy Boats said: “What I particularly like about the DSS is that it is quite simple, because with complexity comes a bit of fear from clients. And from a builder’s perspective, it is easy to put into the boat and to maintain. So given these aspects, and the huge performance gain, it is a great thing and this is a fantastic opportunity for us. We believe that putting foils into boats will become quite standard moving forwards. McConaghy’s facility in China includes three Kuka robots, which will build the foils in the most exacting way, under pressure and at a high temperature. McConaghy Boats will also represent Infiniti Yachts in Australasia and China. Both the Infiniti 46 and 53 are fitted with patented DSS lateral foils. When deployed to leeward, a DSS foil provides vertical lift, dramatically increasing the boat’s righting moment and power. This ‘turbo charger’ is dynamic – the stronger the wind, the faster the yacht (and its DSS foil) travel through the water, and as a result, the more lift and stability the foil generates. This is what gives a DSS-equipped yacht such impressive performance. It also reduces heel and pitching, making for a smoother and subsequently more efficient ride. In lighter winds the DSS foil is simply retracted into the hull, leaving a slender, easily-driven hull form. Fitted with the very latest DSS foils, the Quant 23 ‘flying’ scow, was recently voted European Yacht of the Year 2016. The Infiniti 53 is the first result of Infiniti Yachts’ collaboration with Farr Yacht Design, announced in July 2015. Fitted as standard with a canting keel, a single daggerboard and DSS foil, the Infiniti 53 has a versatile remit ranging from inshore to offshore racing. Farr Yacht Design has conceived the boat as a modern version of its canting keel Cookson 50 design. This offered an unbeatable combination of value, performance and success and, since its introduction in 2003, has won or been on the podium at every major offshore event worldwide. The Infiniti 53 has a very low drag hull form enabling it to be driven efficiently by a reasonable sail plan even in light air, but has the right balance of hull form stability and a deep canting keel, which, in conjunction with the DSS foil, give the 53 unparalleled performance in anything above moderate wind speeds. The 53 features a full length chine, positioned to maximise high speed handling and form stability. Britton Ward, vice president and senior naval architect at Farr Yacht Design confirms that fitting DSS, particularly at reaching angles, can provide a performance yacht such as the Infiniti 53 with a significant speed boost along with the ability to sail at reduced heel angles. Designed by DSS-creator Hugh Welbourn, the Infiniti 46 is an uncompromised carbon fibre racing yacht principally for coastal and offshore events. It is available with fixed keel or canting keel/single daggerboard options to complement its lateral DSS foils. 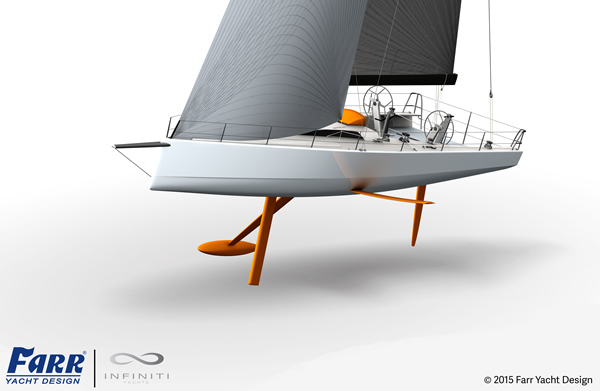 The first Infiniti 46, fitted with a canting keel, is due for launch shortly. Her British owner has a race schedule planned that includes the world’s ‘classic 600 milers’ such as the 2016 Rolex Sydney Hobart and the 2017 Fastnet Race. 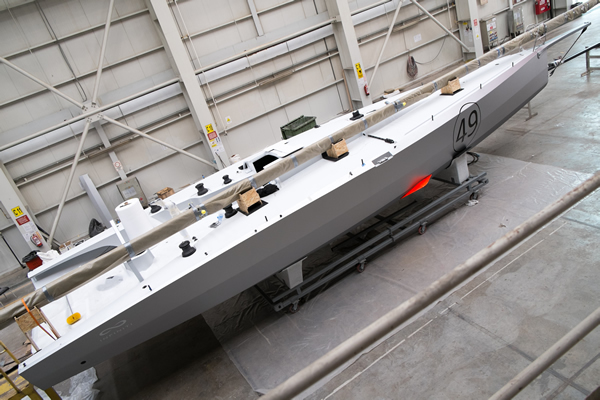 The canting keel provides even more righting moment and stability, enabling the boat to be raced competitively with a crew of just six. But this is just one example; the format and equipping of the Infiniti 46 can be tailored to fit an owner’s race program exactly.